A Clonoe teacher has been appointed Principal at one of the most popular all-abilities secondary schools in the Dungannon District in what promises to be its golden year. 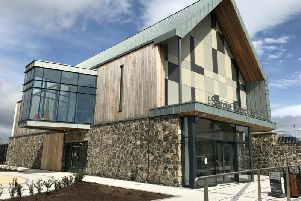 St Ciaran’s College, Ballygawley is celebrating its 50th anniversary, and as well as opening its doors to its year 8 pupils for this historic year, it also welcomed Paul Lavery as its new head teacher. Mr Lavery took up the top role on Thursday following the retirement of Aidan Taggart after ten years of distinguished service. During his tenure as principal, Mr Taggart ensured the planning and implementation of the state-of-the-art 3G pitch at the school, flood walls being built at the entrance to the school and the securing of a specialist school status for maths and business. St Ciaran’s College has continued to grow in reputation as one of top secondary schools in Northern Ireland for its’ academic results, sporting and other extra curricular achievements as well as strong Catholic ethos. Chair of the school’s Board of Governors, Mrs McSorley spoke of the confidence they had in the new principal continuing the success at St Ciaran’s. “Mr Lavery is an outstanding appointment. His experience, determination and leadership skills impressed the interview panel,” she said. Mrs McSorley also reflected on Mr Taggart’s impact as head teacher. “Aidan is an inspirational leader who has raised the profile of St Ciaran’s College across Northern Ireland. Mr Lavery began his career in education 16 years ago in St Patrick’s High School, Keady, where he served as a science teacher, head of department, senior teacher and more recently vice-principal. “St Ciaran’s College is very successful and boasts a proud history. I am clearly joining an excellent school,” he said.